CB (citizens band) radio became popular in the early 1970s and Penney and his father got their licences at that time. 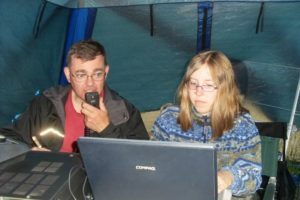 A couple years later, Penney and his father took an amateur radio course offered by the federal Department of Communications, now Industry Canada, and were licenced in 1977. “You’re listening to a signal originating half a world away with about the power a 100 watt light bulb would use,” Penney said. Annapolis Valley Amateur Radio Club president Al Penney, who uses the amateur radio call sign VO1NO, contacts other stations while operating from a tent. This entry was posted in Emergency Preparedness, Events & Celebrations and tagged emergency, Field Day by ve1fal. Bookmark the permalink.